What was the world’s impression of the original Astronauts of the ’50s and ’60s? 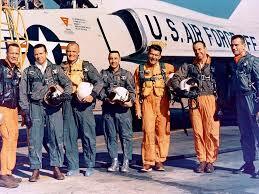 Heroes, experienced jet pilots, brave test pilots: all macho men. Would you believe, when I met him in 1978, one of these macho men was a kindly soul tapping into his creative side? In the mid-1970s, NASA decided to take a new group of Astronauts who would fly aboard its new vehicle, the Space Shuttle. Crews of up to seven would include pilots, scientists, and engineers. For the first time, women, minorities, and non-pilots could apply. NASA created a new branch of the Astronaut Office to manage these newcomers, the Astronaut Candidate Operations and Training Group. 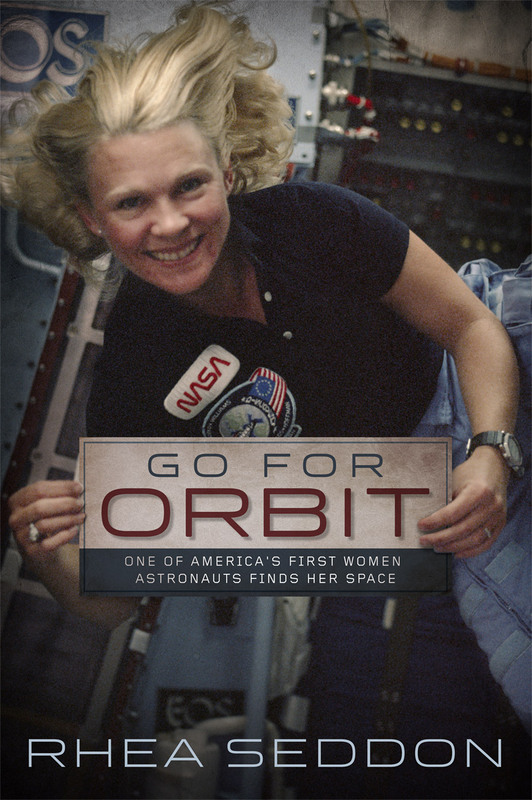 Imagine how different these Shuttle Astronauts would be— college professors, medical doctors, engineers from obscure labs, women: certainly not all macho men. Helping to select and train these new people undoubtedly was not the most sought-after assignment in the Astronaut Corps. 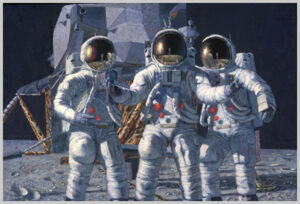 Captain Alan Bean took on the job of heading the group in 1975. He was a typical manly Astronaut—Naval officer, attack pilot, test pilot school graduate—who was selected to the third group of Astronauts in 1963. He flew on Apollo 12 in 1969, landed the Lunar Module on the Ocean of Storms, and became the fourth man to walk on the moon. In 1973, his crew set a record for longest time in space, 59 days, when he flew aboard the Skylab II mission. In 1978, the “The Thirty-Five New Guys” invaded the inner sanctum of the Astronaut Corps. When Al looked at his new protégés, he must have shaken his head. Along with fifteen typical pilots, the group included professors with beards and “girls” who didn’t look old enough to drink. He admitted later he doubted some of us could pass the planned training. But off we went, all over the country, to see if we could be turned into people worthy of spaceflight. Through water survival, parachute training, SCUBA lessons, and endless hours of classes, he watched us soldier on. On one of our airline flights to visit a NASA Center, I sat next to Al and asked him what he planned to do after he retired. His answer took me by surprise; he wanted to be an artist. He told me he was taking art lessons and doing some paintings. As one of only twelve men who had walked on the moon, he wanted to capture what that looked like. But the landscape was drab with only dunes of moon dust in varying shades of gray. He had hit upon the idea of using the humans and their equipment to put color in the scene. What an amazing niche for a former moon-walker! As years went by, his style developed, and I saw the amazing results. Unable to afford his paintings, I bought several posters and beautiful books of his work which Al always autographed for me. Al passed away suddenly and unexpectedly a few weeks ago. He left behind a legacy of vivid colors and thirty-five grateful “new guys,” all of whom flew in space. I wonder in his last flight from this Earth, past the moon and into the heavens, if he was thinking of a painting not yet completed. This is a wonderful tribute to a very good person. Al Bean had the skills and discipline of a test pilot, but the soul of an artist. 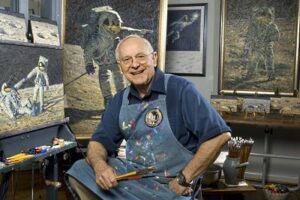 It will be a long time before the Earth sees another person with the talents and experiences of Alan Bean. A warm and wonderful tribute Rhea. I’ll always cherish the few times when Alan offered critiques of my work. He will be sorely missed. Very nice story Rhea! Al was a special man indeed. He was so kind and humble to everyone he met. I’m so glad I got to spend time and talk with him at Spacefests. It wasn’t same this year without him. While he left us all with fond memories. We still all miss him! A few years ago I was escorting some Civil Air Patrol cadets at the Houston Space Center. While there I entered one of the walk through tours and a very nice gentleman was waiting at the rail to guide us on our tour. He was very unassuming and polite. He was very interesting and seemingly knowledge. As it turned out it was non other than Astronaut Alan Bean. I was very impressed that he was taking the time to presumably volunteer his time to act as walking tour guide. A very nice gentleman. A fitting tribute to a great astronaut, amazing artist, and a wonderful human being. You are sorely missed Alan Bean! Really nice tribute! I especially like your last paragraph. I’m sure he did have more paintings planned. Thank you for sharing your memories of him. He was an extraordinary person. Thanks for the wonderful tribute! I was very fortunate to meet and talk with Alan Bean on multiple occasions thru the years at the various Spacefests and Space get-togethers. He was always kind, generous, intelligent, excited about like and people.